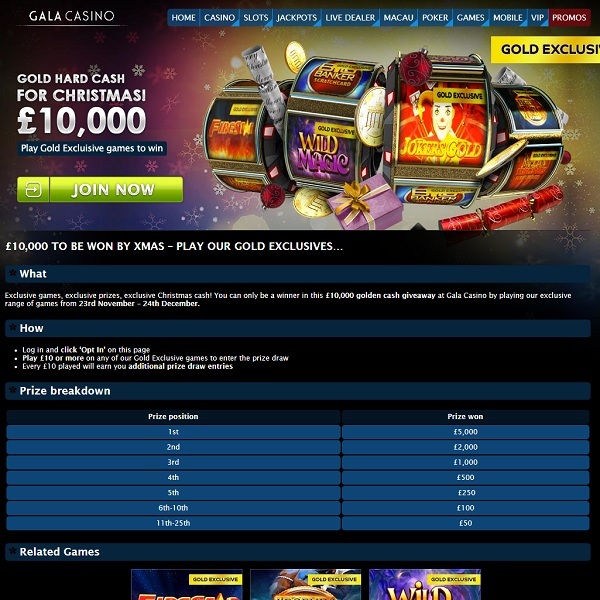 This month Gala Casino is giving its members the chance to win a share of £10,000 in its Gold Exclusives promotion. All you have to do is play the selected games and every £10 you bet on them will earn you one entrance into the prize draw. First prize is a massive £5,000, second prize is £2,000, third is £1,000, fourth is £500 and fifth is £250. Those that are in sixth to tenth place will receive £100 each and the next fifteen names picked will receive £50 each. The eligible games are Firestar, Legends of Racing, Wild Magic, Jokers Gold, Big Banker scratch card and The Magician Triple Pots scratch card. Head over to Gala Casino and start playing today and you could be the winner of a huge pile of cash when the prize draw takes place on December 29th.